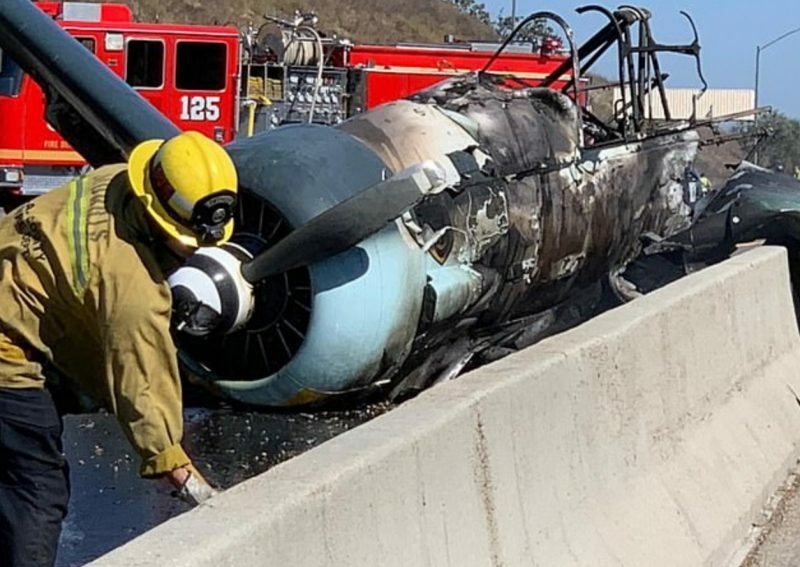 On Tuesday, the 23rd of October 2018, motorists traveling on the US 101 freeway in Agoura Hills, CA saw a lot more than motor vehicles when a plane painted in German colors landed on the highway. The aircraft bounced a couple of times then burst into flames when it hit the concrete center divider. Fortunately, the pilot escaped unharmed. This dramatic crash was captured on video by a driver traveling in the other direction. The footage shows the plane coming in to try and land on the freeway which was clear of cars at the time. The plane’s wing was draped over the center divider while the rest of the aircraft burned furiously, providing a most unusual sight to many motorists. The burning wreckage caused a major traffic snarl-up that stretched for 30 miles west along the freeway outside Los Angeles. The plane, a vintage WWII North American AT-6, belonging to the Condor Squadron, was flown by Rob (no surname given), a professional pilot flying for Alaskan Airlines. The AT-6 is a single-engine plane that was developed during the 1930s and was used by the US Air Force as a trainer during WWII. This particular aircraft was first granted an airworthiness certificate in 1958 but has been almost entirely rebuilt over the years as the components were refurbished, reconditioned, or replaced. The engine that failed in this incident was installed in 2011 and had flown for less than 700 hours. The AT-6, known outside the US as the Harvard, was one of the most popular trainers during WWI. Today, it forms the basis of many aerobatic teams. In the US, the prototype of the AT-6 Texan was first flown on April 1, 1935, and was submitted in March 1937 as a contender in the USAAC “Basic Combat” aircraft competition. The manufacturer completed 180 units of the first model for the US Air Force and sent 400, under the name the Harvard, to the RAF. Altogether, 15,495 T-6s, consisting of several variants, were produced. The T-6 has been used in battle by almost all the world’s air forces. 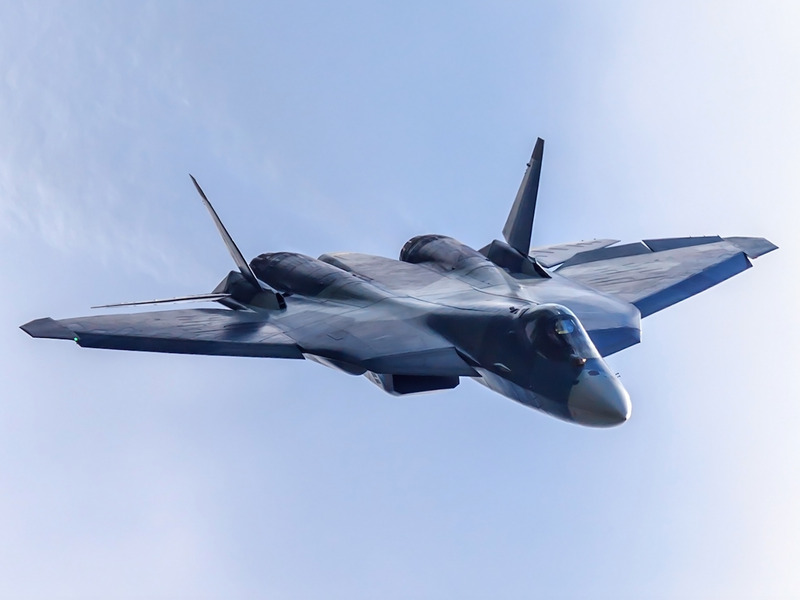 It flew with the Royal Hellenic Air Force in Greece, where the communist guerrilla forces gave the plane the nickname “O Galatas” or “The Milkman,” as they routinely saw such craft flying early in the morning. 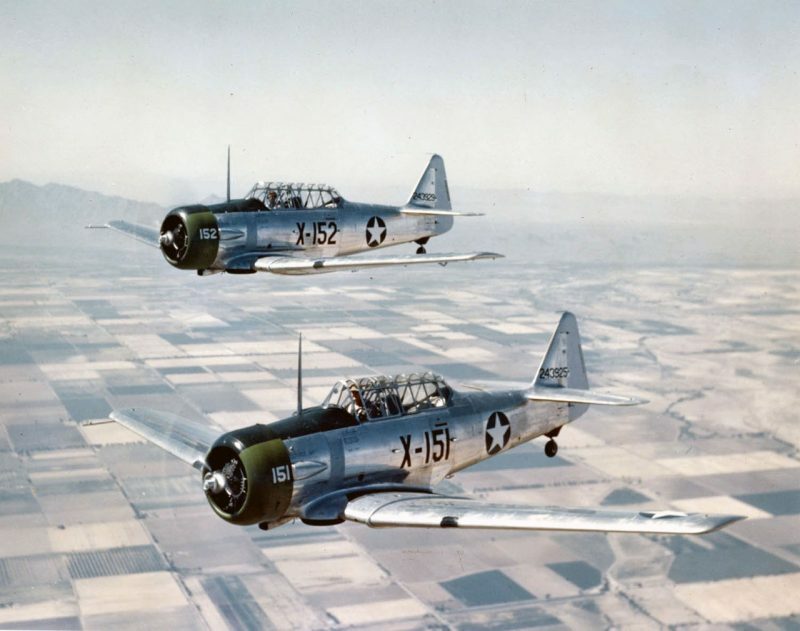 Two U.S. Army Air Forces North American AT-6C-NT Texan trainers (s/n 42-43925, 42-43929) in flight near Luke Field, Arizona (USA), in 1943. The Condor Squadron was founded in 1965 by WWII pilots and is dedicated to the preservation of aviation history. 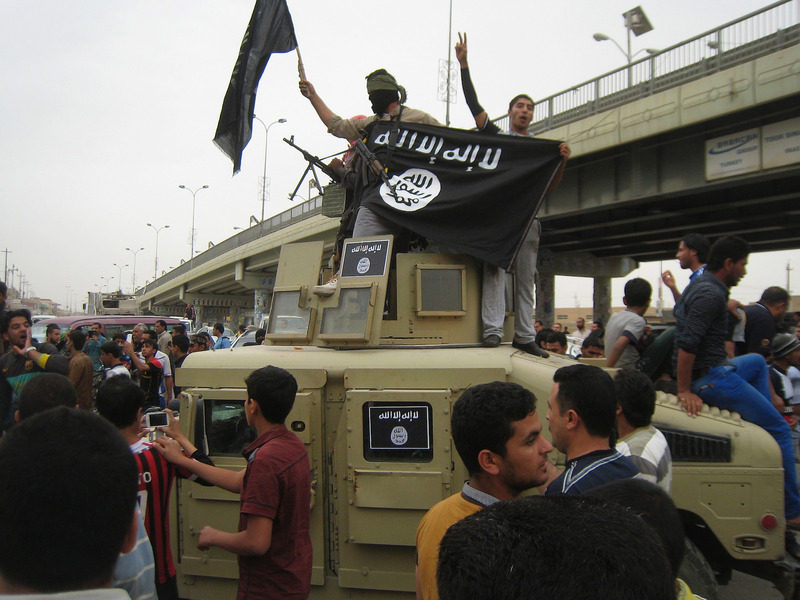 They fly for air shows, parades, memorial services, and other events commemorating veterans. They stage mock dog-fights using planes painted in both Allied and Axis colors. 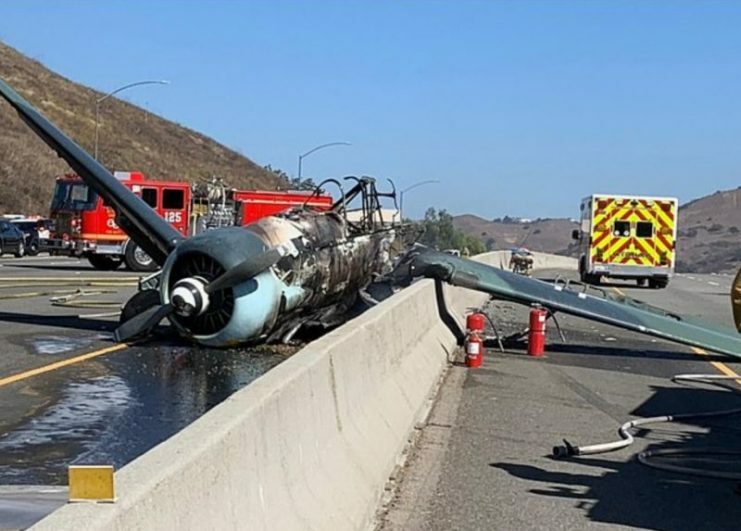 The president of the Condor Squadron, Chris Rushing, said he had no idea what caused the crash, but he was impressed with the pilot’s skill in putting the plane down on the freeway without hitting any cars. Rob told Eyewitness News that he had taken off from Van Nuys Airport, and the plane had experienced complete engine failure. The only place that he was able to see to land was on the freeway, where, luckily, there was a large gap in the cars on one side. Allen Kenitzer, a spokesman for the FAA, said that a full investigation would be carried out by the Federal Aviation Administration and the National Transportation Safety Board.